Izmir has more going for it than meets the eye. Most sites are affordable or FREE. So, after you have spent all your money in Istanbul, pop on down to Izmir and enjoy the cheaper side of traveling in Turkey! Built in 1907 by Nesim Levi Bayraklıoğlu, the historical building was crafted in order to make a connection from the lower level of Karatas to the upper hillside. Nesim built this elevator for the elderly, pregnant, and disabled people to get up to the top street without difficulty. Years later, it was given to the Izmir Municipality to Izmir citizens. The elevator is not only functional but beautifully architected as well. From the top, visitors can see panoramic views of Izmir. Large metal standing binocular provide a closer view of buildings and sites for only one Turkish Lira. At the top, there is a wonderful cafe-restaurant where you can enjoy a meal or just a drink. Along the upper streets, one can see historical houses and decorated stairs. Actually, it’s free! There are two cabins each for 13 people and through the small windows seeing outside is possible. You may just have to wait in line on a busy day. The elevator is located in İzmir’s Karataş quarter, within the boundaries of the metropolitan district of Konak. You can access by boat, tram, bus, or taxi depending on where you are coming from. I like using the İzmir Büyükşehir Belediyesi free App for figuring out transportation. From Karşıyaka area, take any boat towards Konak Ferry Port and then you can take the tramway or walk. On a nice day, definitely take the 20ish minute walk to the elevator! The closer you get to the elevator is surrounded by narrow old streets lined with cafes primed to sit and enjoy. If walking is not an option, hop on the tramway at the Konak Iskele stop and take it one stop to the Karataş tramway – map here. From Alsancak, take the tramway to the Karataş stop and walk from there. Screenshot from the Tramway website. Make sure to stop by the rainbow-colored stairs for a photo shoot. You will definitely look like a local if you do! 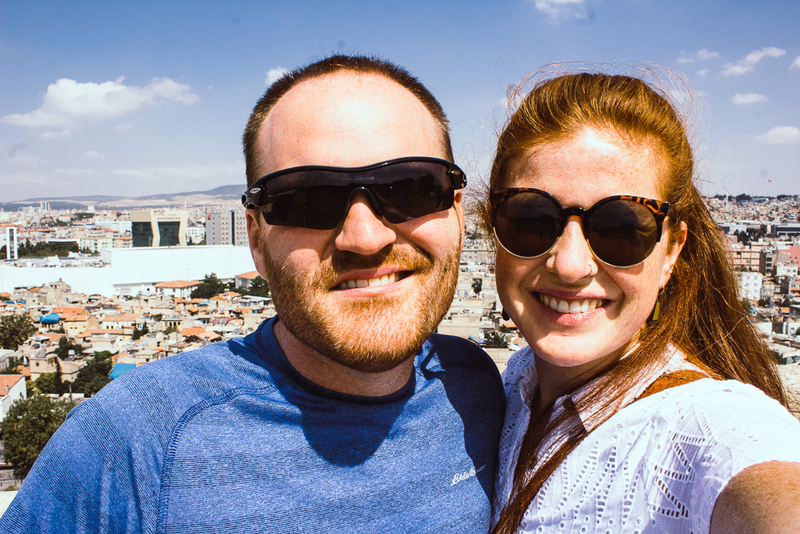 This was one of the highlights of our beautiful city of Izmir and great for seeing the views. We highly recommend it! Would you consider this worth visiting in Izmir? Any other tips for people who want to visit? Comment below and share them with us! 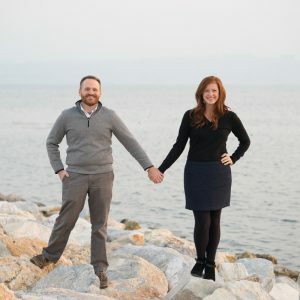 Jason has to be the best husband ever (proud wife bragging rights). We for sure have our multiple disagreements about how to most everything – yep, we are complete opposites for the most part. BUT he is definitely the one who adapts and shifts his desires to suit us way more than I seem too. Maybe because I like everything? 😉 jk. Last fall Jason started running – for me. The last 4 years of our marriage, he has seriously and politely denied all my attempts to start running with me consistently. But he saw how happy it makes me to run with someone and decided that, with my other running buddy eventually moving away, he would fill the void. Plus, running/exercising is good for him – the hard working, computer engineer that he is. It was tough at first, but he pushed through. By December, he was able to do a 5k without stopping. Every other day we went out and did his exactly 5k route while listening to a podcast(mostly to distract him from the fact that he was actually running). 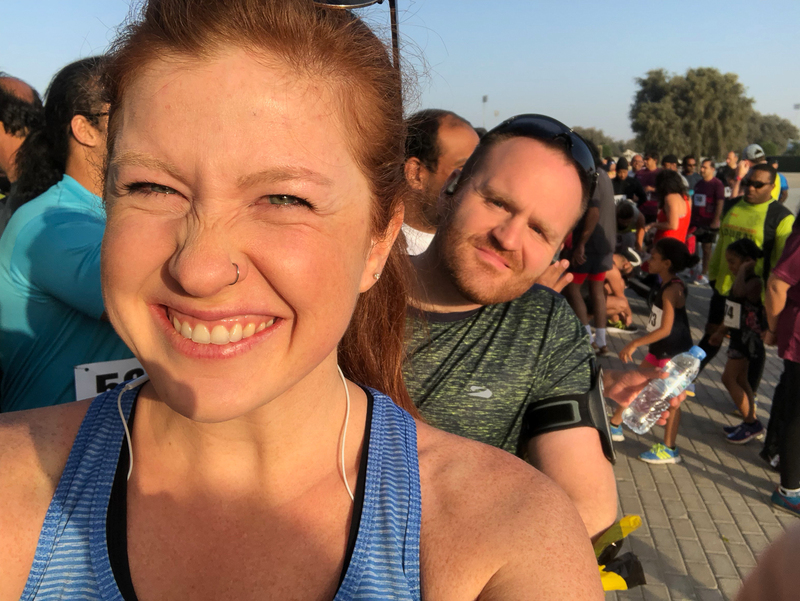 And Christmas 2017, he gifted me with a 10k race that we would run together in February 2018 Dubai Desert Road Run in the UAE! IT WAS THE BEST SURPRISE. We started to train together and did a few longer runs to prepare for the 6.4 ish miles to come. And in February, JASON RAN HIS FIRST RACE EVER. Y’all, I was GIDDY with PRIDE! You see, I grew up running with my family. Heck in 2016, before we moved to Turkey, my family based our get-together around the Chicago Half-Marathon with my mom and sister. Jason by that point had learned how to find us multiple times on the route to take pictures of us and cheer us on, all happily from the sidelines. But this time, we ran with me! And the race was HOT and SWEATY and the course was NOT SO FUN. But we both finished it! You can LISTEN to our experience via Episode047 of our podcast. Have you done something you didn’t like just because you knew it would bless you significant other? Note: This article was originally guest-posted for Yabangee. Izmir offers plenty of local sites within the city of four million people, but it is also known for its access to easy day trips nearby. If you have time, plan a few excursions outside Izmir. 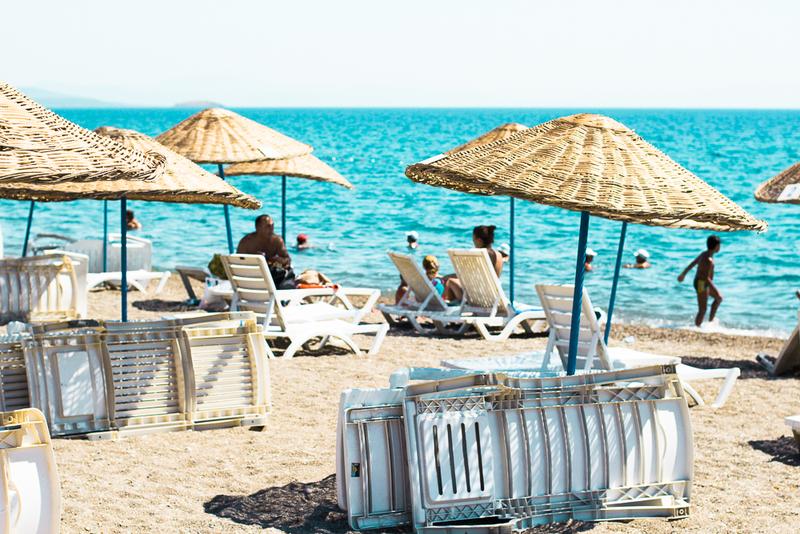 A longer trip inland to Ankara, Cappadocia, or the Black Sea can be tempting but don’t miss the coastal towns along the Aegean and Mediterranean coasts. Little exceeds a well-prepared Turkish breakfast. Şirince, once a Greek village of a mere 600 inhabitants situated north of Ephesus, is famous for its mesmerizing white houses and red-orange clay rooftops. If you are not there in time for breakfast, visit shops known for local fruit wine. Entry is free and you are treated to many free glasses of wine. Ephesus boasts of its 3000-year-old Greek city ruins. Most famous is one of the seven ancient wonders of the world, the Temple of Artemis. The area seduces history lovers with its flavorful tales. Entry is 40 Lira (and an extra 15 lira for the newly excavated covered hillside homes) but if you are interested in history, Ephesus is a must see. If you have time, trek out to the home of Mary, mother of Jesus, renown and highly visited by Catholic tourists. Northwest of Izmir along the Aegean coastline, Eski Foça is named for the now endangered Mediterranean monk seals which also are the town’s mascot. Several local companies offer boat tours that will take passengers closer to the island of the seals for approximately 50 TL which includes lunch. Otherwise, enjoy a meal by the seaside lined with renovated historical, yet charming, Ottoman-Greek houses. While all Turkish food is delicious, the meze, or appetizers, and fish are the best options to get in Foça. Cool off at the Beach! While it’s not possible to swim in the bay in Izmir, beaches line the coast both north and south of the city center. Çeşme comes in an easy first with its pure white sand and crystal clear water, but it also draws a crowd to the much-enjoyed shopping district and nightlight. Take one of the many private buses from your neighborhood or a dolmuş to Çeşme center from the Izmir Otogar. Did you take any day trip? If so, where did you go? Like this post! Save it for later! Having lived in Izmir for over a year, I can say that I truly love the expat life here. Many people ask what the city is like and if it is worth visiting. And my answer? YES! Istanbul or Cappadocia fare better in terms of tourism, but Izmir has things to do that are true to Turkish culture without having to fight the crowds. Also, the people of this lovely city are known for their friendliness and open-mindedness towards foreigners. If visitors are looking for the culture and experience of meeting with locals to truly understand what makes Turkey so wonderful, Izmir is your go-to location. 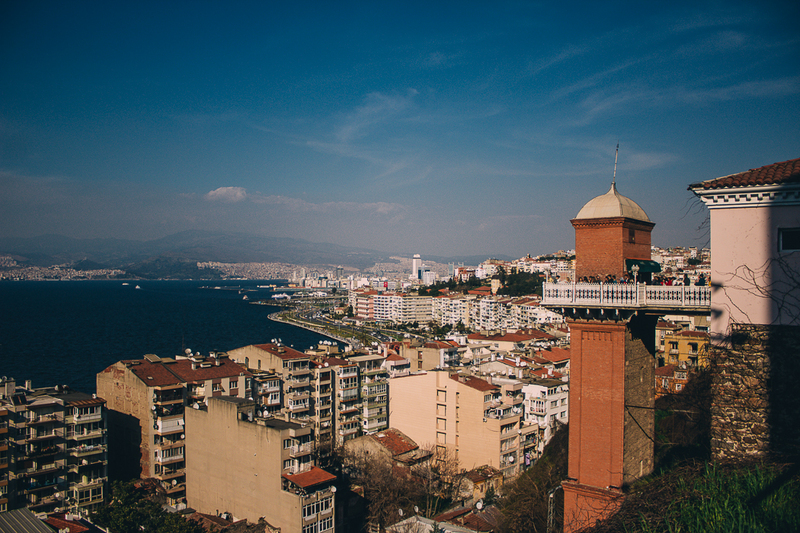 Here are just a few of the things you can do in Izmir. Konak is home to one of the most distinctive landmarks in the city, the Clock Tower. Built in 1901, the white marble tower and North African style patterns on the columns marks the 25th year of Ottoman sultan Abdulhamid II’s reign. Additionally, Konak’s established touristic center of Izmir offers historical mosques and many small streets with cafes, restaurants, and bars. Kemeraltı is the little ‘Grand’ Bazaar of Izmir. Anyone who has been to the noisy, maze of stalls in the Grand Bazaar in Istanbul will prefer this one after a quiet, calm visit! Still a massive maze of stalls, find traditional Turkish gifts and more for a cost much less than Istanbul. Kemeraltı is also full of great, inexpensive restaurants. On a hot day, enjoy a fresh squeezed juice for around $1 in the nearby juice stalls. Asansör, which literally means elevator, was the first elevator built in 1907 to help people travel between the top of the cliff to the seaside. Just a 20 minutes stroll from Konak square, reserve a table for a sunset dinner at the top of the Asansör. The delightfully classy Italian cafe not only provides one of the best views in Izmir, but the prices are very reasonable as well. Kadifekale, or Velvet Castle, built by Alexander the Great into the Izmir hillside provides panoramic views across the city both towards the seaside and the land. Travel by taxi up the monstrous hill to the historic site to have more energy to explore the old walks and towers. Requiring less of the imagination than the ruins of Smyrna, visitors can see the layout of the castle while enjoying a bit of shopping in the shade of the tall trees. Walk back down the long hill or take a taxi again if you prefer. Whether you are in Alsancak or Karşıyaka, this is Izmir! Gençler, or young people, can be found sitting along the seaside enjoying the breeze at the end of a hard work day. Friends and families picnic or drink a beer while others enjoy a walk or bike ride. Free concerts provide entertainment throughout the year. Izmir’s gems are easily overlooked. However, once visitors engage in the history of this coastal city, visitors discover places and activities not offered anywhere else in Turkey. Its secrets lie with the locals and give visitors the best experience of Izmir. While exploring the areas of Izmir, don’t forget a mid-morning snack on a gevrek or two, a traditionally brewed coffee in a small cafe, and a peaceful stroll along the Kordon. 1. Have you been to Izmir? 2. What sites did you see? 3. What did you find interesting? For a less touristy feel, Lesvos, or Mytilini, is your best choice to experience real Greece. This lush, green island has been virtually unaffected by the mass tourism. For the do-it-all traveler who likes to stay busy, Lesvos is the perfect destination with fantastic food, beautiful beaches, pine and hardwood forests, and rivers and over a million olive trees. From Ayvalik, take the 1 hour and 15-minute ferry ride to the port city of Mytilini. Similarly to Chios, visitors can find enough to do in Mytilini by touring the massive castle and several museums, breaking for lunch, coffee, and ice cream. The incredible Chios Mastic Museum pressed us to see other PIOP museums such as the Olive Oil Museum on Lesvos. After renting your car near the harbor, an hour drive west from the port city of Mytilini will take you to the Olive Oil Museum situated in the middle of the island. While it does explain olive oil production, this museum is more about the exemplary restored communal olive press of Aghia Paraskevi, which you can see in action daily at noon except on Tuesdays. The exhibits share the history of the community property and the effect it had on the region’s social fabric and economic structures. Fifteen minutes from the Olive Oil Museum, the bay city of Skala Kallonis won’t make it on anyone’s tourist list, but stopping here is our favorite memory. Sitting at the shaded beachfront restaurant of Dionysos Fish and Meat Restaurant, we took our time eating our weight in Greek salad, fried cheese balls, and grilled meat plate, while our friend’s kid played in the sand and water. The next stops on our journey took us to 2 seaside towns on the north side of the island, Petra and Molyvos (also: Mithymna). Petra’s cliff-top church can be seen from miles away. Stop here for ice cream and stretch your legs from the 35-minute drive with the 114 stairs climb to look at the Orthodox church and panoramic view of the red, clay top roofs lining the north shore. Molyvos Castle sits on the top of a weaving hillside town and claims first place for city’s attractions. For families, this venture requires steep uphill walks that are not kid stroller friendly. Although it was built by the Byzantines, apparently there are stones here from a previous castle during the Trojan War. From the Venetians to the Catalans, to the Genovese and the Ottoman Turks, this castle has seen it all. A close second is the winding, narrow walking streets of the town. Springtime means all the hundred-year-old vines draping over the passageways were blooming fragrant, purple wisteria, providing shade for the owners and visitors. From our morning tour Molyvos, we started our 1.5-hour drive back to Mytilini. Sundays on the Greek islands usually mean many shops and businesses close, but near the still active Moni Agios Taxiarchis Monastery, a small separate cafe sets outs around 100 tables and chairs under the shade of trees. You must order their specialty of fried doughnut-like sweets, called lukumas, dipped in a simple syrup, similar to the lokma you can find on the streets of Izmir. For a little extra flavor, ask for a drizzle of white or plain chocolate with nuts sprinkles. On days other than Sunday, the port of Mytilini is a thriving city to visit. The castle of Mytilene, one of the biggest in the Mediterranean is located on the top of a hill in the northern part of the town. Visitors can walk around the castle and visit, the cistern, the Ottoman baths, the Crypts and the Queen’s Tower among others. The view of Mytilini town from the castle is magnificent. From the castle, head towards the main shopping street, Ermou. Start from the Yeni Tzami, a 19th-century Turkish Mosque and walk down Ermou towards the Agios Therapon Church. Take your time window shopping along Ermou street lined with lovely buildings, shops selling souvenirs and traditional products of the island. If time, take some time to learn about the island’s history at the Archeological Museum. Sundays put a general damper on most of the city for tourists. Outside of the seaside cafes and restaurants, most shops close. However, we made the most of our day by walking and enjoying sweets from multiple little pastry shops we found along the way. Our group of six (four adults and two kids) opted for an apartment style rental in Mylos via booking.com. Apartment style rentals are prevalent in this area for more extended vacation stays by the beach. Near the Moni Agios Taxiarchis Monastery is a small handicrafts town, Mantamados is known for its pottery. Even though its popularity, the handmade ceramics workshop, Stelios Stamatis, remains a small shop packed from floor to ceiling with pottery. Bright flower designs or olive branches adorn all types of dishes to plant holders. All reasonable prices, you need to bring cash as credit cards are not accepted. While photos are allowed of the shop, ask before taking pictures of the ceramic painters. Olive oil products. The island not only offers olive oil, but also olive oil products such as natural soaps, lotions, bowls and other items made from olive oil wood, and souvenirs with hand-painted olive branches. I hope you found my 2 Day Itinerary for Lesvos, Greece helpful! We will definitely return for another weekend and explore other parts of the islands! There is so much more to see! Did you enjoy this 2 Day Itinerary for Lesvos, Greece? Have you been to Lesvos, Greece? What did you love when you traveled to Lesvos? Like it? Share it or pin it for later!